THE NOBLE HERO (to the Heavy Villain): "Stand back, there, gold darn ye!-- If you force this thing to a fifth act, remember that's where I git in my work!" Source | C.J. Taylor, "The Cuban Melodrama," Puck, 3 June 1896. Cite This document | C.J. 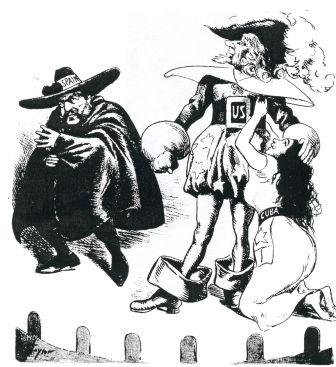 Taylor, “A Cartoonist Depicts "The Cuban Melodrama",” HERB: Resources for Teachers, accessed April 20, 2019, https://herb.ashp.cuny.edu/items/show/630.